Honey tradition in Greece can be traced back for millennia. Greece's unique climate, mountainous terrain and inexhaustible variety of flora offers ideal conditions for the creation of exceptional honey by the skilled beekeeper. 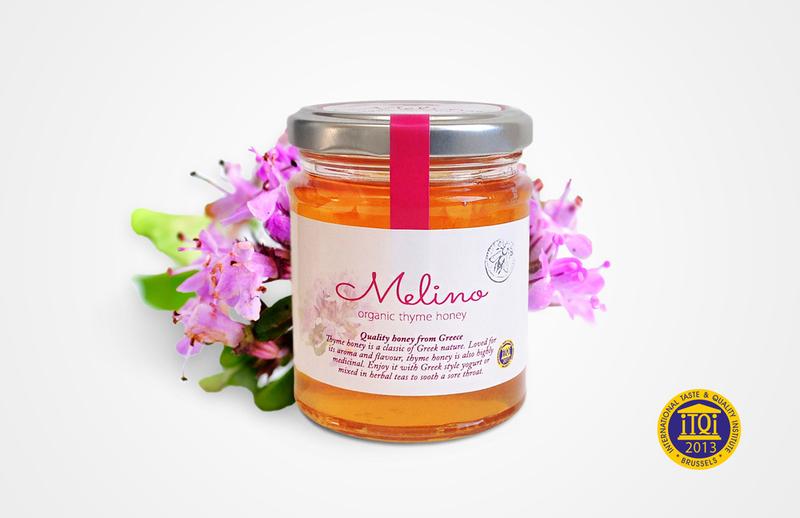 El Greco has selected and offers you the Melino range of three wonderful organic honeys. Thyme honey is a classic of Greek nature. Loved for its aroma and flavour it is produced from thyme shrubs growing wild on rocky hills. The blossoms are available to the bees early in the summer and the honey is harvested by the end of June to early July. Melino thyme honey comes from the Ionian island of Lefkada. It has an attractive amber colour, intense aromas and it is highly medicinal. Enjoy it with Greek style yogurt or mixed in herbal teas to soothe a sore throat. Arbutus (also known as strawberry tree) is a rare type of honey. It is produced only in a few places around the Mediterranean where Arbutus unedo grows wild and in numbers sufficient to support the hives. This unique honey comes from the slopes of Mt Pageon in Northern Greece. It is an autumn honey and it is harvested in the month of November. Melino arbutus honey has a deep colour and a complex bitter-sweet taste which will satisfy even the most demanding palate. It is highly nutritious and also one of the most antioxidant types of honey. Arbutus honey is an excellent addition to a tasty wholesome diet. Chestnut honey is a true forest honey. Dark in colour and less sweet it is rich in minerals and vitamins. Due to its naturally low glucose content it takes a long time to crystallise. Chestnut honey is harvested at the end of June to early July. Melino chestnut honey is produced from hives placed in the heart of the chestnut forests of Mt Pageon. It is an aromatic type of honey and its taste resembles that of caramel. Mix it with tahini or pollen and spread it on bread for an authentic Greek flavour. Melino organic honeys are a Novakidis family creation. With three generations of experience the Novakidis are masters of the art of beekeeping. Their chestnut and arbutus honeys come from the pristine forests of Mt Pageon in Northern Greece. With the summit standing at 1956 meters, emblematic Mt Pageon is a monument of nature. As for their celebrated thyme honey it has its origins in the arid hills of the island of Lefkada in the Ionian sea. The Novakidis being certified organic producers don't feed sugar to their bees during winter. Instead, they allow them to feed upon their own honey. No chemicals are used at any stage and the hives are placed away from any human activity. The extraction process is always cold and centrifugal delivering the 100% unfiltered, raw and organic Melino honey.